Q: What is a blighted ovum? A: A blighted ovum is another word for a miscarriage or a missed abortion. It is a pregnancy where the egg is fertilized and implants and attaches itself to the uterine wall, but the embryo doesn't develop. Cells develop to form the pregnancy sac, but not the embryo itself. 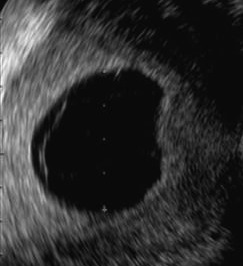 A blighted ovum is usually seen on ultrasound where a pregnancy sac is visible without the embryo. A woman usually does not realize there is a problem with the pregnancy, which by then is thought to be several weeks along, until a doctor fails to detect a heartbeat or the embryo, and an ultrasound reveals an empty gestational sac, without an embryo. There is usually no bleeding or other signs of a failed pregnancy, and without bleeding a blighted ovum is also called a 'missed abortion.' The words chemical pregnancy, blighted ovum, and missed abortion are usually a continuum of the same condition: There is a pregnancy but no live embryo.